Accidents involving a commercial truck, such as an 18-wheeler or other large freight carrier, are usually more severe than an ordinary car accident. Tractor-trailers can weigh 80,000 pounds or more, while an average passenger automobile weighs approximately 3,000 pounds. As a result, any collision between a commercial truck and another vehicle is likely to result in catastrophic injuries and even fatal injuries. The law firm of Samuel Spatzer, P.A., in Miami has experience representing clients throughout Florida, including Miami, Tampa, Melbourne, Orlando, and Dade and Broward counties who have been involved in serious accidents involving trucks. Attorney Spatzer is knowledgeable about insurance and liability laws and the various theories of liability that enable victims of tractor-trailer accidents, and their families, to collect from the parties who caused them harm. Mr. Spatzer has successfully sued and collected damages from owners and operators from trucks. Did you know that there are federal regulations that dictate limits on the time the driver may spend on the road operating his vehicle without rest? Did you know that routine physical examinations are required by federal law? Mr. Spatzer has had experience with these issues and has been successful in proving that truck drivers have caused accidents where they were over-tired, worked excessive hours, were on medication which impaired their ability to properly and safely operate a truck resulting in injury. 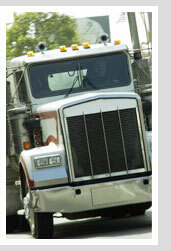 Mr. Spatzer, through investigate techniques is able to complete background investigations on the truck driver and the companies they represent to present the best case of negligence possible. If you have been injured in an accident with a truck, or tractor trailer, you may be entitled to compensation for your pain and suffering. Samuel Spatzer and his team of experts and specialists will assess the amount of damages to which you are and entitled, and then aggressively fight for recovery of those damages in court. Mr. Spatzer uses cutting-edge technology in the courtroom when presenting his clients' cases, including 3-D animations of the accident, full-scale videotaped recreations of your accident with a tractor-trailer, and other exhibits. Mr. Spatzer's attention to detail has earned him much success in recovering sizable settlements for his clients' pain and suffering. If you or your loved one have catastrophic injuries as the result of a serious accident with an 18-wheeler, it is important to secure legal representation as soon as possible. Contact the Law Office of Samuel Spatzer today. Samuel Spatzer represents clients in Miami, Tampa, Melbourne, Orlando, Ft. Lauderdale, Homestead, the Florida Keys, Broward and Dade counties and throughout Florida. He has handled cases throughout the entire country.